The Anthony Davis drama continues. The NBA will fine Davis $50K because his agent, Rich Paul, told ESPN he wanted to be traded. According to the NBA collective bargaining agreement, players or agents can’t publicly request trades and that Paul’s statements were “an intentional effort to undermine the contractual relationship between Davis and the Pelicans.” Davis is making over $25 million this season. One of the great stories in this year’s Super Bowl will be seeing twins Devin McCourty and Jason McCourty play as teammates for the New England Patriots. #32 Devin (safety) has played on the team since 2010 while #30 Jason (cornerback) was picked up this year from the Cleveland Browns. The McCourty’s are the first set of twins to play in a Super Bowl. 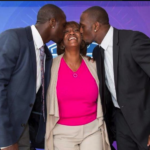 Check out their journey and the influence of their strong mother, Phyllis Harrell (who goes by the Twitter handle @MamaMcCourty).